Plants annual; cespitose. Culms 20-100 cm, erect or decumbent, sometimes rooting at the lower nodes; internodes pilose or pubescent; nodes pubescent to puberulent. Sheaths sparsely to densely pubescent; ligules 0.4-1.1 mm; blades 6-12(22) cm long, 2-8 mm wide, linear, flat to conduplicate, straight, appressed to divergent, both surfaces sparsely to densely pubescent with short, evenly spaced hairs. Panicles 6-20 cm long, 0.3-1.2 cm wide; rachises pilose, longer hairs 0.1-0.8 mm; branches 10-20(28), 15-45(60) mm long, 0.2-0.4 mm wide, appressed, pubescent to setose, not winged, with 8-16 mostly solitary spikelets, occasionally paired at the base of the branches; pedicels 0.2-1 mm, variously hirsute below, apices with fewer than 10 hairs more than 0.5 mm long. Spikelets (3.1)3.5-4.5(5) mm long, 1.2-1.7 mm wide, lanceolate. Upper glumes as long as the lower lemmas, with sparsely appressed pubescence on the lower 2/3, scabrous or glabrous distally, 3-9-veined, acuminate and awned, awns 0.4-1 mm; lower florets sterile; lower lemmas 3-4.3 mm long, 1.2-1.7 mm wide, lanceolate, setose, 3-7-veined, acuminate, unawned or mucronate; lower paleas absent; upper lemmas 2-2.5 mm, indurate, elliptic, 5-7-veined, acute to rounded and awned, awns 0.4-1.1 mm; upper paleas indurate, faintly rugose, blunt. 2n = 36. 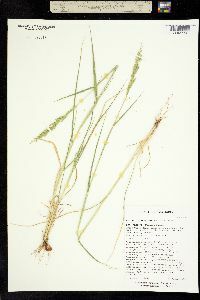 Eriochloa contracta grows in fields, ditches, and other disturbed areas. It is known only from the United States, being native and common in the central United States, and adventive to the east and southwest. It differs from E. acuminata in its tightly contracted, almost cylindrical panicles and longer lemma awns, but intermediate forms can be found. 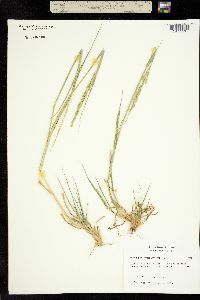 It can also be confused with first-year plants of the perennial E. punctata, which have glabrous leaves, narrower and more tapering spikelets, and longer lemma awns. Annual herb, tufted 20 cm - 1 m tall Leaves: alternate, two-ranked. Sheaths open, sparsely to densely hairy. Ligules 0.5 - 1 mm long, membranous, fringed with hairs. Blades appressed to divergent, 6 - 20 cm long, 2 - 8 mm wide, linear, flat to folded lengthwise, densely short-hairy, parallel-veined. 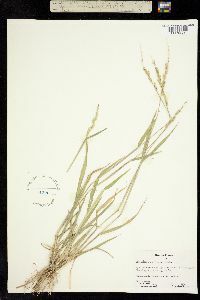 Inflorescence: a terminal, branched arrangement of spikelets (panicle), 6 - 20 cm long, 0.5 - 1 cm wide, spike-like, on an elongate and softly hairy axis. 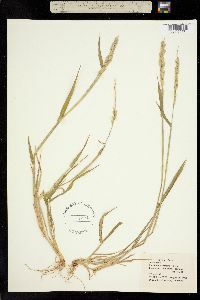 Branches ten to twenty five, appressed, 1.5 - 4.5 cm long, to 0.5 mm wide, hairy to bristly, bearing eight to sixteen spikelets. Fruit: a caryopsis, indehiscent, enclosed within the persistent lemma and palea. Culm: upright or decumbent, 20 cm - 1 m long, round in cross-section, sometimes rooting at the lower nodes, and hairy. Nodes two to five, minutely hairy to hairy. 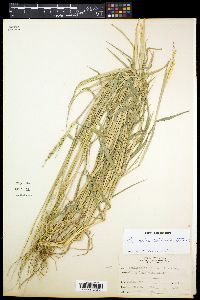 Spikelets: mostly solitary, stalked, 3 - 5 mm long, 1 - 2 mm wide, lance-shaped. Florets: two per spikelet. Lower florets sterile. Upper florets bisexual. Lodicules two, papery. Anthers three. Styles two-branched, purple, with feather-like hairs. Stigmas red. Glumes:: Lower glumes reduced and forming a cup-like structure. Upper glumes equal to lower lemmas, pointed and bristle-tipped at the apex (bristle to 1 mm long), three- to nine-veined, sparsely appressed-hairy on lower two-thirds. Lemmas:: Lower lemmas similar to upper glumes in size, shape, and texture, 3 - 4.5 mm long, 1 - 1.5 mm wide, lance-shaped with a pointed apex, three- to seven-veined, bristly. Upper lemmas 2 - 2.5 mm long, elliptic with a pointed to rounded apex, bristle-tipped (to 1 mm long), rounded at the back, hardened, wrinkled, five- to seven-veined, with rolled-up margins. Paleas:: Lower paleas absent. Upper paleas hardened, faintly wrinkled, blunt. Habitat and ecology: Introduced from farther west. Found in disturbed areas such as fields and ditches. Etymology: Eriochloa comes from the Greek words erion, meaning wool, and chloe, meaning grass, referring to the usually hairy spikelet axes and flower stalks. Contracta means contracted. Tufted annual 3-8 dm, the culms hirsutulous; lvs flat, 4-7 mm wide, hairy; panicle 10-15 cm, contracted, its base included in the upper sheath; racemes several, overlapping, 1-2 cm, the rachis and pedicels (1 mm) hairy, the thickened pedicel-tip glabrous, purple-margined; spikelets borne singly at the nodes of the infl-branches, or paired only at the base, lance-ovoid, 3.5-4 mm, the second glume slenderly acuminate, the sterile lemma similar but a little shorter; fertile lemma with a slender awn 0.3-1 mm; 2n=36. Damp soil; Nebr. to Colo., La., and Ariz., and intr. in Minn., Mo., Ill., and Va.